Let me first say I'm rooting for Coach Chamberlin. UD football is more "labor of love" than "fame and fortune". As far as I know, he has represented us well and developed hundreds of fine young men. 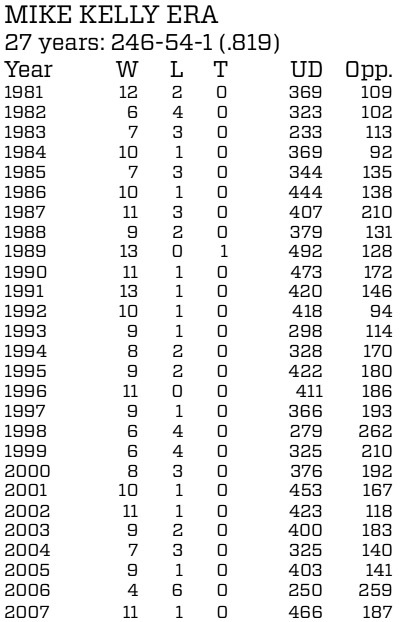 Coach Kelly was 6-4 in '98-99, and 4-6 before retirement. 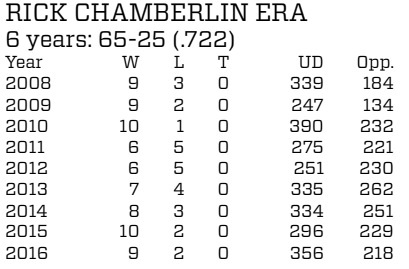 That said, Coach Chamberlin may be the first to admit this season has been disappointing. We need to win out to finish 6-5. Coach will be 61 in April. I bet Neil Sullivan has a succession plan. Was Coach at any risk after consecutive 6-5's in 2012? An occasional Jim Harbaugh may stop by the PFL for a cup of coffee, as he did in San Diego. But it takes a special breed to be more than a stepping stone. Here's a list of current PFL coaches -- UD stacks up well. Mike Minter (NFL) at Campbell is interesting, but they're moving up to Big South. here's some PFL attendance figures showing UD below average -- sure wish we had an intimate, historic on-campus stadium. any word on future lacrosse shared facility? Hiring Anthony Grant or Shauna Green is one thing, but where do you go for football candidates? Could certainly promote from within. To me, D-II/III partial or non-scholly experience makes sense. Maybe you could find a Frank Solich who's continuing at Ohio for "love of the game". Last edited by Columbia Blue; 10-26-2017 at 11:56 AM..
My only two-cents on the coaching subject has to do not about coaching games but recruiting. Was Kelly's record extra special because of it? His 2006 team lost a great QB for much of the time. That poor season had nothing to do about coaching. Chamberlin had Valentino & some great receivers not to mention linebackers & D-ends for his first three years, then had trouble recovering the magic. So if anyone questions Chamberlin to me, he best center on recruiting rather than play-calling, X's & O's, etc. We need him to recruit guys who can be PFL POW and Player of the Year (several times) and 1st Team All-PFL three years at two positions. That helps secure good records & a good history. BTW, Switzerland never ever won a Euro Bowl until they recruited ex-PFL winners which goes to show that talent can be found at the non-scholarship level. There has repeatedly been hints of moving football back on campus to bring in more students. Well we have vball, men's women's soccer right there on campus and draw less than football at welcome. Thanx Avid for the attendance comparison. A move to a smaller site on campus is mostly an alum thing. Would be nice but as a non-alum/student, Welcome location is fine for me. It don't look good with a small crowd. The nice little turnout that EMU had for their Thursday nite game at NIU didn't look good on TV in that big stadium either. It is what it is, less attended on Thursday, or away or not playoff time. My complaint since 2006 has to do with atmosphere. And that's UD's fault. They lease a good stadium owned by the City Public Schools & need to clear out after a game. So portable, wheeled, motorized, etc stuff is an answer. I see some nice railing banners on the visitor side naming the college. End zone displays on trailers or air-filled or self-standing flags/banners. One might be amazed how neat Welcome could look! BTW, for new fathers here, in 2006 the stadium had a smooooooth green carpet, a one-story white painted wood shack for press & coaches and the whole place needed painting! Not a single banner that year! Welcome has seen worse days than today. We need the camera whether streaming or Spectrum to be on opposite side to show the UD fans, bench and not look like an empty stadium. Would cheng the perception of the game for those watching via tube or Internet. Only reason I can see for not having camera on that side would be sun from the west. But at least have one camera the lead camera,don't need wiring as they are wireless today. Avid got me thinking about some UD fans who don't visit here like he does since I've been around. I remember those fast typers who gave a play-by-play right here on this site because the radio was only local (not streaming) in those days. We usually had a nice crowd here & I was so slow at hunt & peck that two more plays would be run before my comment arrived! Well, it is nice to have a few fathers here; but in this day of Social Media, one would expect the list to be longer. While I don't understand those who don't participate, I respect their decision. Sometimes I hear in later years that others read the Pride but never want to post for personal reasons. As far as newer alums here; their absence speaks loud about the game attendance & interest shown by this college's students for football. It was so surprising to me since in the mid-fifties, at a small Div.3 school I attended, the stadium was "the place to be" on Saturday. And you should have seen the HUGE Homecoming decorations we built all night before. Ah, those were the days! Thanks for reading me. Thanks Flyer Gramps for remembering me. I haven't posted for a couple years for various reasons. Mainly my horse in this race is in a different pasture now. Although, I have made it to at least one game a year, still know players and families, and just enjoy tailgating and catching up with people. IMO Drake and Butler were wins I had doubted. Especially Drake at their place where we usually get our rears handed to us for some reason. I do think it may be time for a change and listening to players from 3-5 years ago, it is still same feeling. I never will call for someones job and not doing so now. I just think a different mentality and relationship is needed for today's kids. I heard a rumor a couple years ago of promoting from within current staff. The name mentioned may work. I certainly am not in favor of because you are a "Dayton man" it gives extra credence. I think this thinking has hurt us in the past and still may be doing so. Don't want to mention specifics, but I think you can see this years offensive production is less than past. I know this may include many reasons, but philosophy always impacts the bottom line. I'm pretty certain one coach is done. He has cut back on involvement and is likely finished. It will be a big loss because he is very well liked and respected by his players. Not sure if this is where Flyer Gramps was going, but if so great. If not, well you awoke a dormant poster. I am still an RC fan and in his camp. If you look back over the years you will see that the defense has been consistently good and that is his forte. The offense has come and gone largely based on the talent of the QB and the person calling the plays. When we had DW calling the plays and Valentino at QB we were humming. We had a little bit of a lull for a couple of years based more on the play calling than on the QB play (when my wife knows what play is coming next you know the other team does). Then we got a new OC who played to the strength of our QB and we were a playof team again. I think the jury is still out on the current OC. He was handicapped a bit this year with our QB getting injured before the season. I may be missing something but to me, the key for UD to continue to have success if for RC to make sure that we have a creative OC that understands the talent and uses it to our advantage and to continue to recruit trigger men who can run the offense. If we do that we will continue to be succeful. It would be great if we could bring on an OC that decides to stay for 20+ years like DW did but I doubt that is in the cards with the way coaches move around today. There is simply too much money at the higher levels of D1 football for coachaes not to chase it so we can expect that if we bring in talented assistants they are going to leave and chase bigger dollars. The key will be to continue to find the next up and coming talent coach to replace them. No head coach is going to be 100% successful in bringing in the right assitants and putting them in the righ spots (just look at Urban and Ohio State last year when they had to replace both the OC and the QB Coach) but if RC keeps that as his focus and continues to recruit players that fit the UD profile we will continue to be successful. I am a season ticketholder who attends many away games. The Flyer Football program is special to me and I am not an alum. This program helped create a stronger bond between my dad (an alum) and I for over 20 years. Now, it is creating a stronger bond between my son and I and my daughter and I. I think my daughter loves going to football games as much as I do. She has taught her friends about football at our local high school games. I look at the goings on here every day. I don't always post, but I can't imagine not having a Dayton Football Program or talking here about the sport at UD I love the most. It is the one time of the year I most look forward to. My wish for the program is to keep it like it is, but move on campus and to open up the offense. We are too vanilla in what we do and it is easy to spot our next move. I too did not attend Dayton nor did my father or my children. However a small grandson did attend and had great success. So here we are 10 years after his last game and I still follow the team although do not attend games. My wife had a stroke & then other issues for 12 days in the hospital. I missed the game at Davidson. The team & coaches signed a card and mailed it to her with "speedy recovery" wishes. I doubt if a person signing even knew her except that she was a fan. Now that's classy people at a classy school, don't you think? Yes Indeed Flyer Gramps... Hope recovery is going smoothly. Go Flyers! My son and I met you @Flyer_Gramps at Campbell. We met up at Jacksonville and I hung out with the Flyer Moms who were sitting in the back of that cruddy muddy excuse for bleachers. I yelled more than most dads and they loved it. That is some good memories. We met up at Welcome too once. Your grandson was a great Flyer and the things he did for the Flyers are stilled talked about on the radio and in the stands. I do think next year's Flyers will be better and we still have a tough game with Valpo who is better than in recent years. I look forward to a great season next year. Flyers Gramps, I do hope all is getting better for your wife and for you. Peace and how about a Volleyball National Championship along with some National Championships for the Men's and Women's Basketball team for your Christmas Stocking!